Our thoughts really do have an impact on our world. Negative thoughts about family members or fellow employees change our relationships. If we dislike someone at work and allow ourselves to think poorly of them, they are likely to fulfill our low expectations. If we pray for them and ask God to bless them, while asking the Lord to bless our interaction with them, they become changed for the good and so do we. We’ve all heard the image of the one person whose cup is half empty, while the other person’s cup is half full. The former person is likely to go through life with unfulfilled goals, while the latter will see their world blossom as a beautiful garden. Even all the weeds in that garden will be seen as beautiful if we keep negative thoughts at bay. I’ve counseled depressed individuals over the years to take a brisk walk every day for at least forty minutes while saying the Jesus Prayer. Their depression subsides within days because the exercise, coupled with the prayer, pushes aside negative thoughts and sends depression into the abyss from which it originated. Our negative thoughts keep us from the joy that is ours in Christ and keeps that joy from uplifting others. If we fight off negative thoughts we allow Christ to change us and those around us. 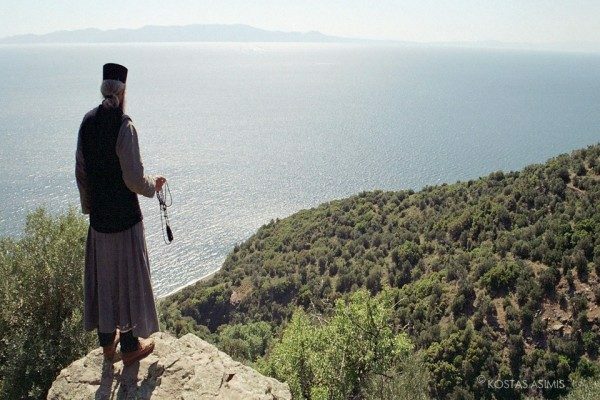 Saint Seraphim of Sarov said that if we acquire peace, a thousand around us will be saved. Negative thoughts do not promote peace!